Project Plant is an organization founded in December 1984 to make the City of Athens a more attractive place to live and to do business. 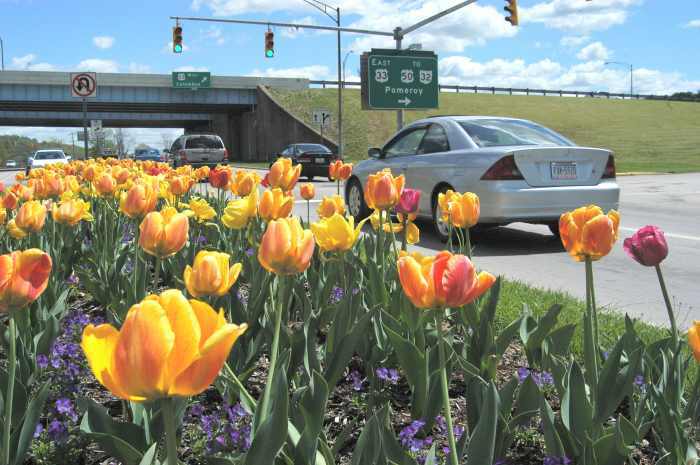 Project Plant's five large traffic island gardens at Athens City entrances, plus the Mansfield House gardens at the Athens County Convention and Visitor's Bureau, greet everyone in the City. We also have several smaller gardens in public spaces throughout the City including a City parking lot garden on Columbia started by the Second Street neighborhood. Project Plant hires Thyme and Again Gardens to plant and maintain all the gardens noted above, and volunteers help weekly at Mansfield House. Most of the funding for this unusual project comes from Athens citizens who support these gardens through contributions. Project Plant also gets funding from Tourism monies. This fall we will start small naturalizing gardens along three of the long, wooden stairs that connect ridge-top streets to streets below in hilly Athens. 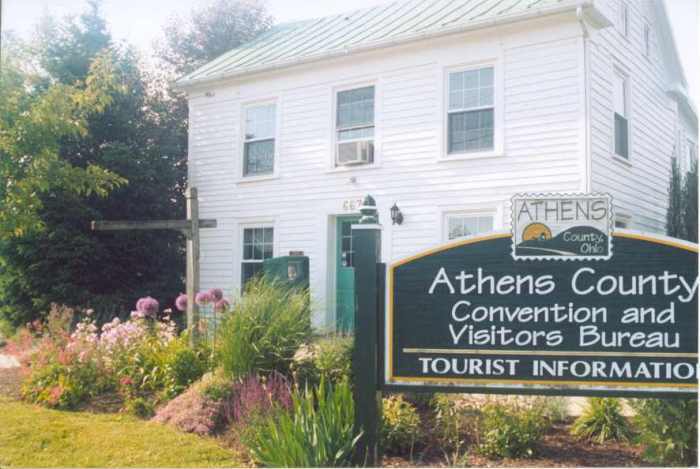 Funded by a 2005 Athens Foundation grant, the project will include spring flowering bulbs along the path, plus native wild flowers and other naturalizing plants, clustered near the mid-point of each set of stairs. WHERE ARE THE PROJECT PLANT GARDENS? Our two biggest gardens are at this intersection, on large traffic islands flanking the eastern and western sides of Richland Avenue. 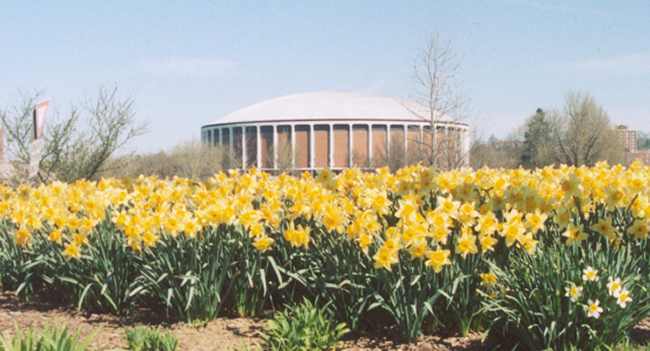 Located just south of the Hocking River, this is an important entry to Ohio University, the Kennedy Art Museum, and the Dairy Barn Cultural Arts Center. Just west of the Route 33 entry to East State Street you will find our most flamboyant traffic island. 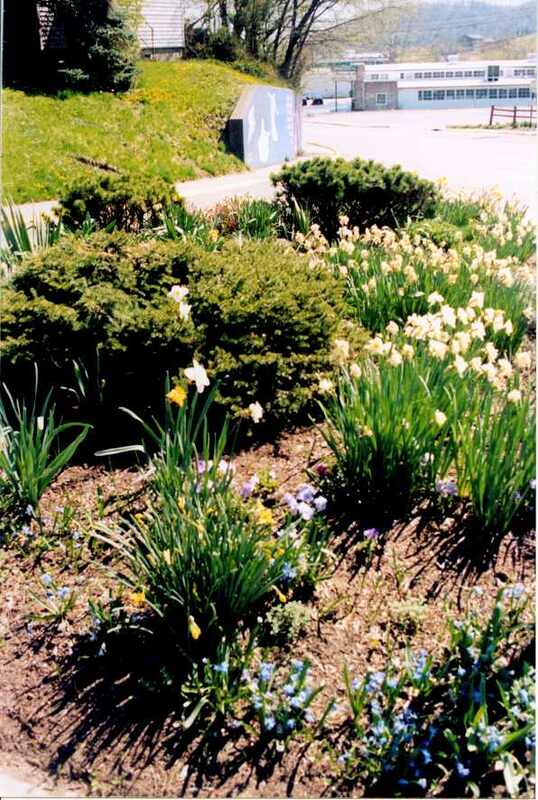 Every year spring bulbs and pansies give way to a colorful bed of annuals. 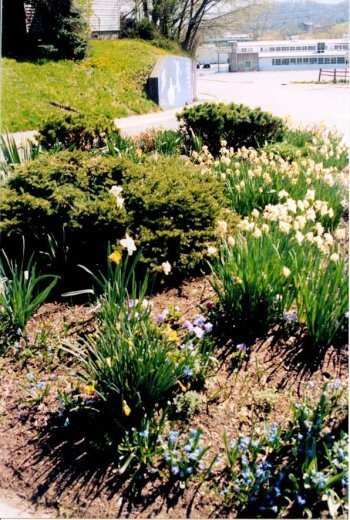 This garden greets folks coming to the City's east side residential area, recreational facilities and its eastern commercial corridor. Project Plant plants and tends the gardens around Mansfield House, the old wood-frame house that is home to the Athens County Convention and Visitors Bureau. An heirloom rose garden in the back perfumes the yard in late May and early June. Bring a snack to the picnic bench here and breath in one of Athens sweetest offerings: roses from another era. At the top of Stimson Avenue, Project Plant has a perennial garden with year-round interest. 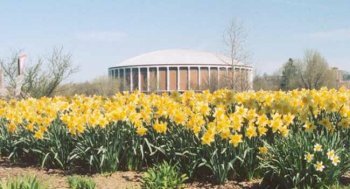 Lots of pedestrian traffic passes by this big perennial garden, coming from residential areas to nearby businesses and to campus further on. Native stag horn sumac gives a sculptural quality to this garden on the northern tip of Athens. The garden graces the entry to an office and business corridor of the City. Some Second Street neighborhood residents started this garden for Project Plant in the 1990s. Located at the corner of a City parking lot, the small perennial garden has a low stone wall and is one of the first gardens to bloom in the spring.